Gemini has been performing since 1973 and are now playing music for their third—or is it fourth?—generation of young fans and families. From their home base in Ann Arbor, Michigan, San and Laz have performed to enthusiastic audiences at concert halls, festivals, community centers and elementary schools throughout the US and Canada. In 1997 Gemini added a new and very exciting facet to their music as they began performing with symphony orchestras, including the Detroit Symphony Orchestra and the Kansas City Symphony. 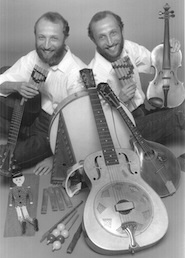 The twin brothers' retrospective compilation, "The Best of Gemini," received a 1999 Directors' Choice Award from Early Childhood News, as well as a Silver Honors Award from Parents' Choice Magazine. "Volume 2 of the Best of Gemini" includes their newest original songs, as well as traditional songs from all around the world. In 2002 Gemini teamed up with an acclaimed chamber orchestra, the Phoenix Ensemble, to release "The OrchestraIs Here to Play!" This unique folk-classical collaboration — the perfect introduction to classical music for young listeners through songs they love—has won awards from Parents' Choice Magazine, as well as from the Children's Music Web. Gemini's newest recording, released in April 2010, is "Once Upon A Time... The Storytelling Album," featuring folk tales from around the world, with musical elements added to each story. This CD also features "Perfect Pitch," a new story by San, which includes original orchestral music interspersed throughout. Gemini has received ASCAP's "Popular Awards," a songwriting and recording award from the American Society of Composers, Authors, and Publishers, every year since 1995. A number of Gemini's songs were listed in the 1995 edition of Children's Jukebox, a subject guide to musical recordings used by librarians and teachers throughout the US. In 1997 Gemini's work was honored by a Silver Medallion Award from the Wolf Trap Institute for Early Learning Through the Arts. Gemini's music is published by the Hal Leonard Publishing Corporation, the world's largest music publisher. Since 1994, Hal Leonard has published Gemini's first songbook and two musical revues for Elementary Schools based on Gemini's songs. These two revues, "Kids are Kids The Whole World Round," and "In Our Family," have been performed by children in schools throughout North America. San and Laz have received songwriting grants from the Michigan Council for the Arts, and have written music for educational TV and films at Wayne State University. They have also arranged and recorded twelve albums of international ethnic folk dance music to accompany the book "Rhythmically Moving" by Phyllis Weikart, a leading authority on movement and dance. These recordings, published by the High/Scope Educational Research Foundation, are used internationally by early childhood educators to teach movement and dance to children.